This blog post will guide you about the basics of Java Applet. This tutorial will teach you how to run a simple Applet in Java. So, What is an Applet in Java ? An Applet is a small java program that runs in a Java enabled web browser. Java Applet is a small piece of java code that is embedded into HTML page, which gets executed when the HTML page loads into the browser. Applet runs on the Client machine, while Servlet runs on Server side. They are rarely used to make website dynamic. Its secure and platform independent. They require JVM and Java enabled web browser such as IE, Mozilla etc, to get execute on client machine. Applets are embedded into HTML documents and has various methods in java.applet.Applet, which governs its life-cycle. a) Create an HTML file as above, containing the APPLET tag. b) Compile the applet source code using javac. c) Open the html file in the web browser. a) Write HTML APPLET tag in comments in the source file. 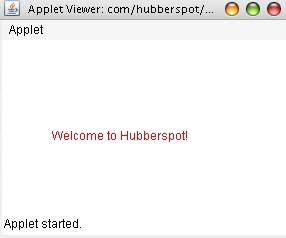 c) Use appletviewer ClassName.class to view the applet.